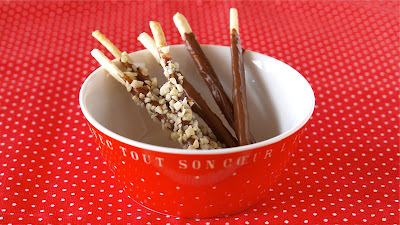 Pocky is a very popular treat produced by the Ezaki Glico Company of Japan! 1. Mix cake flour, granulated sugar, and salt in a bowl. 2. Add in butter, use your fingers to crumble it. 3. Add milk, use a spatula to crumble it again. 4. Wrap into one using plastic wrap. Cool in the fridge for 30 minutes to set. 5. Preheat the oven to 170C (338F). Place the dough between 2 pieces of plastic wrap. Flatten out the dough using a rolling pin to 3mm (0.1 inch) thick. Trim off the excess dough, then cut into thin 3mm (0.1 inch) strips. 6. Bake at 170C (338F) for 13-15 minutes. Leave to cool completely. 7. Dip the biscuit into melted chocolate and coat with sprinkles if you like.